Cal Fire says the Valley Fire in Lake County has grown to over 25,000 acres burning homes, shutting down parts of Highway 29 and forcing the evacuation of thousands of people from of nearby towns. LAKE COUNTY, Calif. (KGO) -- Cal Fire says the Valley Fire in Lake County has grown to over 25,000 acres burning homes, shutting down parts of Highway 29 and forcing the evacuation of nearby towns and more than 3,000 people. 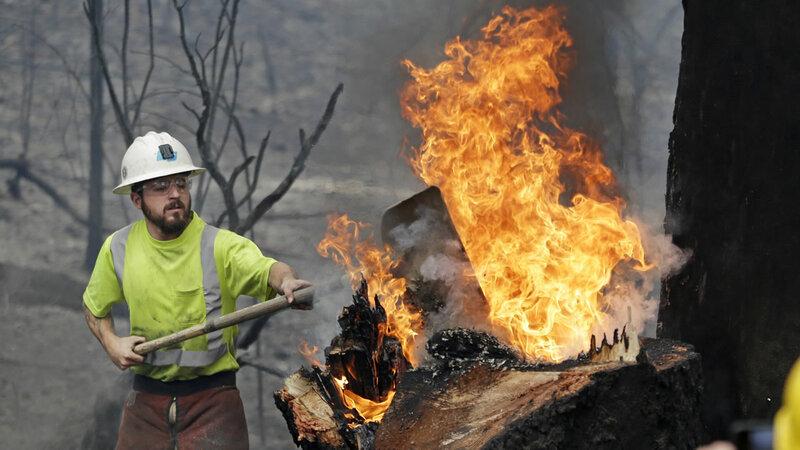 The California Department of Forestry and Fire Protection says the fire began around 1:30 p.m. Saturday in Lake County, which is about 100 miles north of San Francisco. At its start, it was 50 acres, but grew to 400 by 4 p.m. It was over 10,000 acres by 6:30 p.m. It was past 25,000 acres late Saturday night. Just In - The #ValleyFire in Lake County has grown to 25,000 acres. Hundreds of firefighters working throughout the night protecting homes. "Everything I've heard so far is everything behind the gas station is gone, the school is gone, the store is gone and a lot of people had dogs stuck up there," said Cobb resident Jamie Kelley. "As we came down just fire everywhere and all of our houses our neighbor's houses, our friend's houses. Everybody's houses are burning up its awful," Joyce Reim, who also lives in Cobb. Cal Fire says an unknown number of homes have been destroyed. There are also reports that Middletown Christian School was destroyed in the fire. Bottle Rock Road, High Valley Road, Hwy 175 Cobb, Hwy 29 Tubbs Lane (Calistoga, Napa County) to Hwy 29/Hwy 53 (Lower Lake, Lake County) Butts Canyon Road to Napa County Line, including Berreyssa Estates. The evacuation orders also includes the communities of Cobb, Seigler Canyon, Loch Lomond, Middletown and Hidden Valley Lakes. Several road have also been closed in Lake County: Highway 29 at Bottle Rock Road, Highway 29 at Highway 175 (Kelseyville and Middletown), Highway 29 at Red Hills Road and Highway 29 at Loch Lomond. Highway 29 is also closed from Spruce Grove Road North in Lower Lake to Butts Canyon Road in Middletown. Residents have been advised to gather their medications, pets, and important papers and leave the area immediately. If residents are evacuated they may seek shelter at the, Kelseyville Presbyterian Church, which is located at 5340 Church Street in Kelseyville. An evacuation center has been set up for residents on the south side of the Valley Fire at the Napa County Fairgrounds in Calistoga. "It looked like a sideways tornado the smoke was rolling across the planes," said Lacy Port from Lake Port, who had to escape. Cell service is spotty, which added to the tension as people desperately wait for news from loved ones. More than 100 firefighters from Cal Fire and the South Lake County Fire Protection District are on the scene. Aerial resources are aggressively fighting the High Valley Incident that is burning at a moderate of spread in oak grass woodland. Cal Fire PIO Daniel Berlant told ABC7 News that the dry conditions due to the drought are why these California wildfires are spreading so fast. He also said the extent of the injuries to the firefighter is not yet known. Cal Fire said four firefighters suffered second-degree burn injuries and were transported to the burn center at U.C. Davis Medical Center. All are in stable condition. They were members of a helicopter crew based in Lake County. President of CAL FIRE Local 2881, tweeted that he visited the for injured firefighters and said they are all expected to make full recovery.